and a part of the dynamic cultural scene in the Pioneer Valley. Enter the building through the Main East Entrance. Sun Studio is upstairs on the left. I-91 North, take exit 18 and travel toward Northampton via Rt 5. Turn left on Rt. 9. From Northampton head West on Rt 9 passing Smith College and through the light at Cooley Dickinson Hospital. Continue on Rt 9 to Florence’s second traffic light. At the next cross street, turn right onto Pine Street. Continue on Pine Street merging with traffic coming from the right, you start to go down a hill. You’ll see a mini mall on your left. 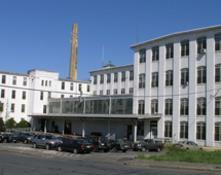 Then ARTS & INDUSTRY BUILDING on your right –see photo. I-91 South, take exit 20 and at the end of ramp turn right onto Bridge Rd. At second light take left onto N. Maple St.
Go straight through Florence’s main light onto Maple St. Turn right at Pine St. ARTS & INDUSTRY BUILDING is visible from there.